Let us face it, many of our mothers stopped making cakes from scratch thanks to Betty Crocker, this easy Dutch oven chocolate cake is made on the same principal. The reason is, the box cake mixes do a pretty good job at making a decent cake quickly and with little hassle. 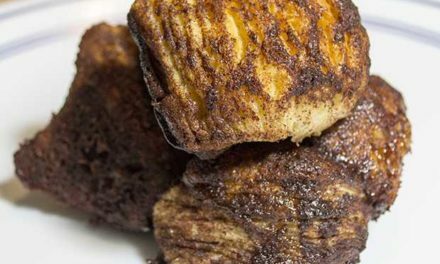 These boxed cakes are so fun and super easy to take camping and bake in a Dutch oven. I have done these cakes several times on camping trips to celebrate a camping buddies birthday. Not only is the cake well received, but it really makes the birthday girl or boy feel special because you baked it out camping. I use a large 12 Dutch oven for this and the cake is just one layer. I also followed the directions on the box and used the time for the largest sheet cake they had listed. I loveDutch oven cooking but find cleaning it is a pain. For this reason, I highly recommend using Dutch oven liners to simplify the process. These liners are aluminum pans that fit perfectly inside the Dutch oven. You add the food to the liner instead of the Dutch oven and you can remove the liner once the food is cooked. This keeps the cast iron clean on the inside. I once made a whole bunch of pizza’s using one Dutch oven and two Dutch oven liners. While one pizza was cooking, I prepared the other one in the liner. When the first pizza was ready, I simply removed the liner with the cooked pizza and added the new one with the newly prepped pizza. This made feeding lots of people pizza outdoors, quick and easy. Unfortunately, I was out of liners when I made this recipe. Time to hit up Amazon again for some outdoor cooking supplies. Dutch oven chocolate cake batter. Cooking outdoors in a Dutch oven is easy using your grill. 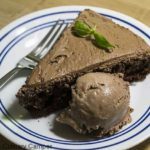 I did think about making this cake from scratch, but when I saw all the cake mixes we had stocked up on in the pantry, I decided this would be an easy Dutch oven chocolate cake. 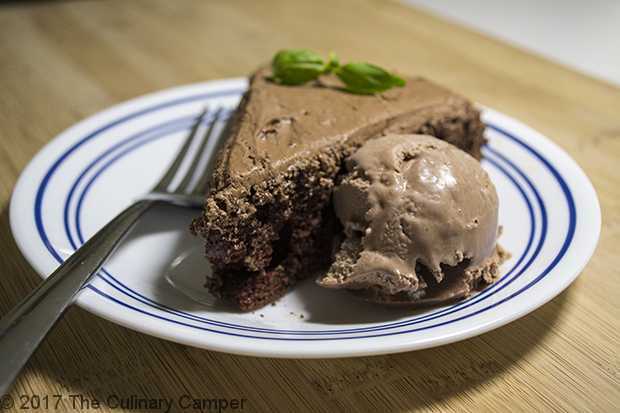 Let’s face it, when you are baking a chocolate cake on a camping trip, easy is the way to go. The secret to making a cake in a Dutch oven is to replace the liquid with a lime soda. They say it really helps to make the cake moist (sorry if you hate that word, LOL) and fluffy. I don’t know if this is true, but it is fun to do anyway. Lets face it, I have a degree in recreation and leisure studies, I am all about the fun! I was looking up interesting stuff about chocolate cake and came across this posting at From The Grapevine. 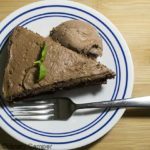 I found several other articles like it stating that chocolate cake is good for you and why you should eat it for breakfast. What this actually suggests is that you eat your higher calorie meals in the morning, and the suggestion is breakfast with dessert. Since chocolate is proven to be good for you (although the sugar may not be) it makes sense to have a slice for your breakfast dessert. Everything in moderation though, I don’t condone or discredit this, I just thought it was interesting. Go ahead, Google chocolate cake. Lots of folks are saying it is good for you. Now go forth and make easy Dutch oven chocolate cake! 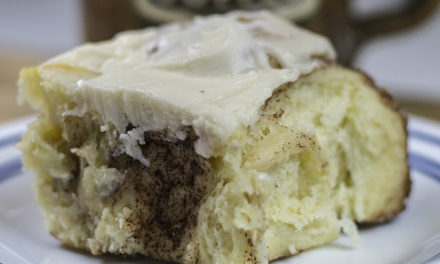 I know some good people who own the Cj&Y Decadent Dessert Bakery here on Whidbey Island in Washington state. I’ve never tasted a better cake in my life and the buttercream frosting they put on their cakes is possibly the best frosting I have ever had. This is not shortening frosting but real butter and cream. With this in mind, I decided to take a stab at buttercream for this cake. I was shocked at how easy a basic buttercream recipe is. While it is simple, my buttercream does not live up to Cj&Y’s famous and secret buttercream recipe. I will just have to live with that fact, they are the professional bakers after all. My buttercream was still pretty good so here is my quick buttercream recipe. If you are camping, considering buying a canned frosting or make this ahead of time at home and store it in your cooler. Since the buttercream needs to be whipped, making it by hand will be tedious and hard work. After all, we are trying to keep this recipe simple. Add all the ingredients to a stand mixer. Start the mixer on low to incorporate the ingredients. Scrape the sides often. Once the ingredients are incorporated, turn the mixer on to medium and beat for 10 to 15 minutes. This will make the frosting fluffier. Add more milk slowly if the frosting appears too dry. Make your favorite cake outdoors with this deliciously easy recipe. Prepare coals according to the temperature on the box. This box said to bake at 325 degrees F. According to the Dutch oven cooking chart, that is 15 coals on top and 7 on the bottom for my 12-inch Dutch oven. Follow the mixing directions on the box and mix in a bowl. Alternatively, you can mix the cake in the Dutch oven but grease the oven first. Grease the Dutch oven with Crisco or lard and flour. Pour the cake batter into the Dutch oven and cover with the lid. Place Dutch oven over 7 coals on the bottom, and 15 on top. Bake according to instructions on the box. This cake was done in 20 minutes. The cake is done when you can dip a toothpick or fork in the cake and it comes out clean. Remove the oven from the coals and remove the lid, let stand for 10 minutes before removing. Carefully remove the cake from the Dutch oven by placing a cooling grate or plate over the Dutch oven and turning it over. Beware as the cast iron will still be hot. See The Culinary Camper for the Dutch oven cooking chart. Happy birthday to my mom, who would have been 86 today. I made this cake in honor of her birthday and the 4th of July. Happy 4th everyone! I’ve made this before but not with buttercream frosting. I think making the frosting ahead of time is a great idea! I’ll try that next time. This is so much fun to do in a Dutch oven, and who doesn’t love treats when you’re camping. I agree this is a blast to make and I love impressing my friends and family with my cooking skills over a campfire. I recently saw a Pinterest where someone had made their own Dutch oven liners by cutting out some parchment paper. I think this is a great idea. I am going to try it next time I use my Dutch oven.